She’s not afraid to drive again in the nights in the very city where she was harassed so terribly only a few nights back. The 29-year-old DJ, Varnika Kundu, who was stalked and harassed by Vikas Barala, the son of Haryana BJP chief Subhash Barala, is no "abla nari" needing empowerment. On the contrary, she’s exactly the strong, independent woman that our patriarchal society and misogynist state wants to subdue. A profile of Varnika Kundu – the woman doesn’t want to hide behind the stigmatic and vulnerable tag “victim” – is necessary, not just to understand what self-aware, educated, professional, confident, sexually and intellectually independent Indian women look like, but what they seek when they confront the law of the land. They seek justice, they want rules upheld. They don’t need protection of the patriarchal state as women, but as citizens. Kundu is and wants to remain, to be counted as an equal citizen of this country, calling out for justice against the injustice committed against her, and against millions of other women. 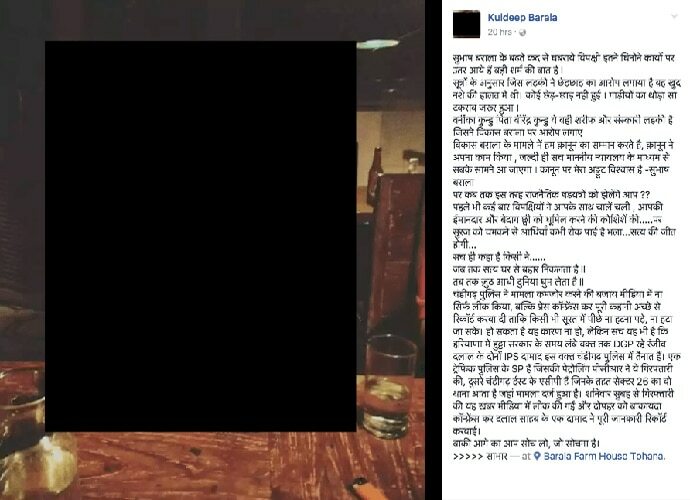 In a detailed Facebook post that’s as chilling as it is precise, Kundu decides to come forward, and not lock herself up in the cloister of shock and grief. No. Kundu, and her senior IAS officer father, after completing the procedure of filing an FIR with the Chandigarh Police, decide to tell the story via the ubiquitous medium of social outreach – Facebook. That post is a fantastic illustration of Varnika Kundu’s sense of self-worth, her confident self-positioning as the injured party without letting the narrative of “victimhood” define her solely. Of course, this is her privilege talking and helping her frame the discourse. But when she says “lucky I’m not lying raped and murdered in a ditch”, she’s expressing empathy towards those women who were less fortunate, insofar as escaping without being physically hurt from a traumatic episode such as what Kundu went through on the intervening night of August 4 and 5, can be deemed fortunate. While she thanked Chandigarh Police for showing up in the nick of time, her later interviews and discussions with various news outlets spell out clearly that she had mentioned the men had all the intentions of kidnapping her, a non-bailable offence under the Indian Penal Code. That those charges were dropped from the FIR when calls and BJP leaders kept coming all night at the police station, is telling. Says Varnika to India Today: “I have faith in the system.” Moreover, instead of positioning herself as the “victim”, she says she’s the “complainant”, offsetting the patriarchal narrative of the stalked, tainted and contained woman. In the interview, it’s important to note, that Varnika is still behind the steering wheels. She’s not afraid to drive again in the nights in the very city where she lives and where she was harassed so terribly only a few nights back. The full interview is a testament to Varnika’s courage, her bold temperament and her staunch refusal to bow down to pressure from a political influential family belonging to the ruling regime. She’s here to fight stalking – a typical patriarchal activity underscoring male pre-entitlement to female bodies – and not just her stalker. “We are thankful that she survived this ordeal. The goons had a very clear intention of abducting her, and she escaped due to her courage and presence of mind, but it was a very close call, and her trauma is unimaginable. I suppose it will take her a long time to go back to a normal life. As a father of two daughters, I feel compelled to take this matter to its logical conclusion. The goons must be punished, and the law must take its course. As would be expected, the goons are from influential families. We all know most such cases of harassment go unpunished and even unreported. Most people would not want or dare to take on goons from influential families. I feel if people with some privileges like us cannot stand up to such criminals, nobody in India can. More importantly, I will be failing in my duty as a father to my daughter if I did not stand with her completely in this matter. I am sharing this with you all for two reasons. One, to give a true and clear picture of what happened. Two, to get some assurance of support in case its needed. Our clear intention is to bring the culprits to book. We do not intend to harm the families or relatives. However, we know it’s not going to be an easy struggle. The possibility of harassment and witch-hunting, threats and even physical harm is undeniable, even though unlikely. Influential families can sometimes take desperate measures to discredit or disable the complainants. Sane friends may advise us against our course of action. We may be foolhardy. Both Varnika and her father have shown strong determination to seek out justice. They are a stark contrast to the manner in which an array of BJP spokespersons behaved, chiefly Shaina NC, who called her a “victim beti” and shared an old photo of Varnika with her friends. Kuldeep Barala, the nephew of Subhash Barala against whom, it surfaced, there exists criminal charges of kidnapping, tried playing the social media character assassination game against Kundu. But Shaina NC and Barala had to retract and face social media rebuke for her disgusting comments attempting to shame Kundu. It must be noted that Varnika Kundu has neither “checked” her mobility at nights, nor has she slunk back in dismay after the horrific incident. What she had to face, however, was the collective apathy and institutional stalking of our patriarchal state, which fails women at every point, despite having relatively effective laws in place. This resulted in a watered down FIR, as a result of which, Vikas Barala and his accomplice, Ashish Kumar, were let off, released on bail. But the second stumbling block came when no top leader of the BJP condemned the incident directly. In fact, ML Khattar said that Subhash Barala cannot be punished for the alleged crimes of his son. Of course, the social media campaign to malign Kundu was set off immediately. Even a leader like Kirron Kher tweeted that “we should not play politics with a woman’s dignity”, as if it’s asking for justice, and not the stalking itself, is that. This inversion of logic is, however, typical from the BJP-ruled states, where victims of lynching are booked and not the perpetrators themselves. Kundu’s case also illustrates how women are shamed for reporting crimes, making access to law and knocking on the door of justice that much more daunting on the woman. Far from bringing up the rate of conviction, this makes even reporting a crime a herculean task for the woman, because of inevitable replay of the crime that happens at every step of the way. This reverse-criminalising the victim of the perpetrated crime is typical of a patriarchal, misogynist state that wants to police women in the kitchen, in the bedroom, in the streets, in the office, in public and private space, and virtually everywhere, tying to pin them to antediluvian ideas about femininity, body and a woman’s role in the scheme of things. The highly articulate Varnika Kundu and her senior bureaucrat father might have won the media trial, but what about those Varnikas who aren’t from this well-off a background? This is a test case – but also an open and shut case – with (retrieved) CCTV footages, witness testimony, and more. Yet, the ordeal that Kundu had to go through tells a chilling story.